The breathtaking Waterfall Retreat at Reed’s Island is a spectacular 4 bedroom, 3 bath home in the exclusive area of Reed’s Island in Hilo. The home is only a few minutes from downtown Hilo but it feels like a private paradise retreat with a stunning river and falls right outside your window. The tropical rainforest views, Wailuku river and the falls natural beauty make this home a one-of-a-kind vacation destination. This home has many luxury features: The living room has large windows and sliding doors that showcase the extraordinary rainforest with picturesque views of the waterfall and Wailuku river. We have installed new flooring throughout the house. 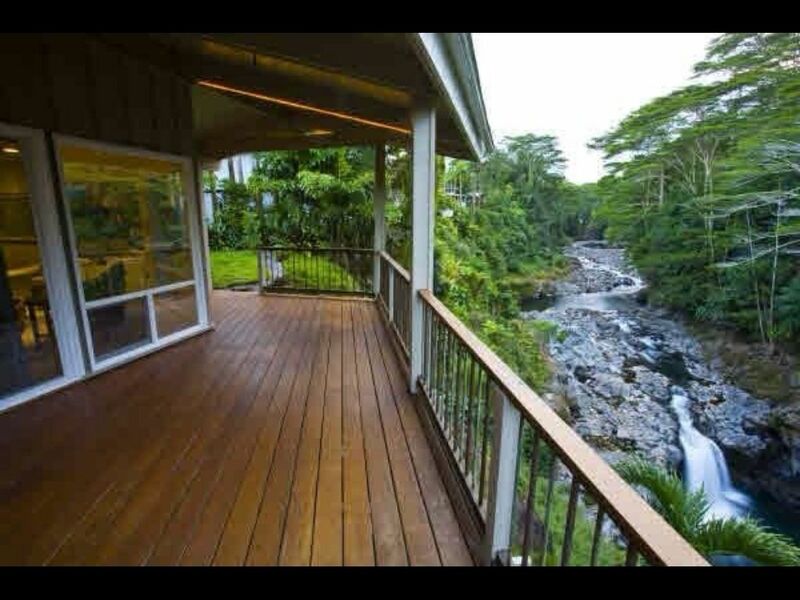 You may enjoy your meals in front of waterfall out on the lanai, a relaxing area on the 700 sq ft pinewood deck. While you are on the lanai, you may enjoy the view of the well-landscaped tropical garden, the colorful flowers and plants, feel the tender-green, soft Korean Grass, and listening to nature’s symphony: the tree-frog’s greeting, the waterfall flowing and the birds singing. Kitchen is stocked with dishes and cookware for any cooking enthusiast. Coffee and herbal teas provided for guests. The bathrooms are furnished with clean and new linens, soap, shampoo, conditioner and hair dryer. Other amenities include flat screen tv, washer and dryer and parking for 3-4 cars. Relax and stay here at the magical Waterfall Retreat at Reed’s island, an experience that you will treasure for the rest of your life. The home will not be shared with any other guests and the home is used exclusively as a vacation rental. The one time cleaning fee for the house is $200. There is an extra guest fee after 4 guests of $25-35 per person per night. The WATERFALLS RETREAT at Reed's Island is cared for by Suzy and Peter Sternlicht. As our guests, we would be happy to help you find the best places to visit and we look forward to helping make your stay as comfortable as possible. Please feel free to inquire if you have any questions. Thank you! Guests may call us at any time if there are problems with the home. Guests may call or contact us with questions about the place or places to visit at any reasonable time. The managers live a few minutes away from the property. The neighborhood is minutes from downtown Hilo but because of its private and exclusive location, you feel like you are in a distant and tropical retreat. There is parking for 3-4 cars. Please note, there is a hot tub on premises but it is not working and it is not offered as an amenity. The home is also located on a cliff overlooking a river. There is a partial area that is not fenced. Please know that the owner is not liable for any injures that may occur if guests attempt to walk near the edge or climb down the cliff. Owner’s personal injury liability only applies to registered guests. Additional visitors to this property do so at their own risk. @ bathrooms located upstairs and one bathroom with shower located on the main level. Each bathroom has shampoo, conditioner,body wash and moisturizer. Hairdryer in each bathroom. Located along the edge of the Wailuku River. Stunning waterfall views right outside the porch and windows. There is a 2 car garage and space in the driveway for 1-2 more cars. Coffee, tea, butter, creamer, sugar, salt and pepper. There are 5 areas for dining. Kitchen counter seats 3, living dining table sits 4, kitchen dining area sits 6, porch dining area sits 4 and another porch dining area sits 2. This house was a perfect first top for us on our Hawaiian vacation. The waterfall was amazing and we spent a lot of time on the lanai just watching it and relaxing with some coffee. The amenities were perfect for our family of 7 and the location was far enough from Hilo that we felt "away" and close enough that we walked to town a few times to pickup groceries or take out food. Suzy was super responsive to any questions we had as well. The location was great for visiting the natural sights of Hawaii including Volcanoes National Park, Mauna Kea, the waterfalls around Hilo and we enjoyed swimming, snorkeling and wading at Carlsmith Park. If we come back to Hawaii, we will not hesitate to book this house again. This home was past perfect for 4 adult couples! We loved everything about it! Suzy was great , easy to contact and quick to respond. We highly recommend this rental. Overall we had a great time here, but we did have a few complaints. The good: BEAUTIFUL location -- its even prettier in person! Good downstairs area for eating and sitting, nice sized bedrooms, amazing wrap around porch. Nice and close to the town as well. The not so good: The information said "air conditioning", but really, it was just one window air conditioner in one of the bedrooms (not the master). It wasn't a big deal for us in December, but I think the posting for the rental is very misleading. They also had cameras set up inside the house -- we for sure saw one in the kitchen area, but were not sure if they were anywhere else. In all the rental properties I have stayed in for vacations, I have never run into this, and found it to be very creepy. All in all, we would stay there again, but the air conditioning and cameras should be taken into account. What a great night sleep that river creates. Heavenly. The pictures don't do it justice. Worked out great for our party of seven. Really need to figure out that home sound system though. Would have been that much better to have some music while enjoying that deck in the evening. Thanks for making our stay so comfortable. Loved the constant sound of the waterfalls and the panoramic view - beautiful in photos but you have to be there to fully appreciate it. As someone who struggles with warm weather, I did find the lack of AC made it hard to sleep, and I would have enjoyed more casual curl-up-and-read sort of seating on the deck so we could while away our afternoons out there, but overall, a lovely and well-maintained home and an absolutely stunning location. The Waterfall Retreat at Reed's island is located in one of Hilo's most private and exclusive locations. Nestled between two flowing rivers, Reed's island is the perfect location for privacy and convenience. Additional guests after 4 is $35. per person per night.